My husband and I chose this Bible verse to be read and sung at our wedding almost 23 years ago. Although the context is Ruth, a daughter-in-law, speaking to Naomi, her mother-in-law, it is a perfect picture of loyalty and commitment in relationships. The entire book of Ruth describes God’s redeeming love for His bride, the Church. How fitting, then, for a scripture reading at a wedding! My husband is indeed “my beautiful love in Christ” and I’m so thankful for him! It’s important to journal our gratitude in our Bibles, especially for our spouses. It’s too easy to think about all the things that annoy us about our spouses, and the things that we would like to change. But the more we focus on how grateful we are for who and what they ARE, rather than for what they are NOT, the more our love and appreciation grows for them. I encourage you to journal your love and gratitude for your spouse and/or other loved ones. I created this page using several Sweet’N Sassy stamp sets, distress oxide inks, watercolor pencils, and a doily and washi for embellishments. I began with the Brotherly Love and Girl Power sets to create the images of my husband and me. When using these sets, it is important to stamp and then mask the elements you want to appear on top so you don’t have intersecting lines. 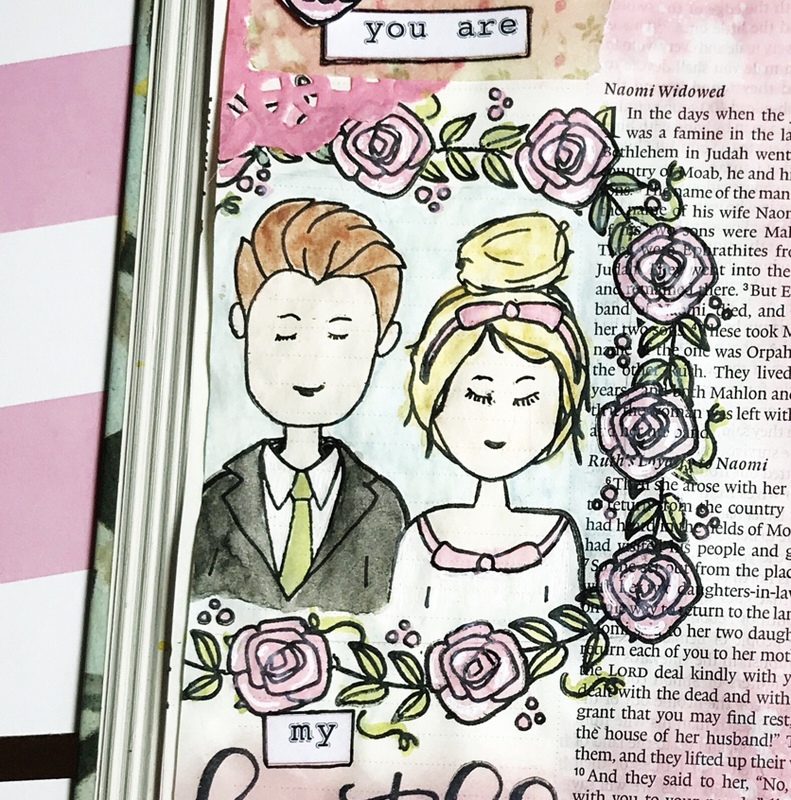 Next, I created the rose frame around the bride and groom with the Itty Bitty Blossoms set, again masking the roses so it appears the greenery and rose stamps work together, rather than conflict with each other. I stamped a few extra roses and fussy cut them out to use around the page. I colored the stamped images, as well as sponged the page with distress oxide ink. I then stamped the words “beautiful” and “love” using the Hello, My Name Is set. (The stamp actually says “loved” but I masked off the “d”). I added the doily in the corners, mainly to cover up where I accidentally DROPPED the “beautiful” stamp! I added a bit of white detailing on the roses with a white gel pen. Finally, I stamped the music staff texture stamp from Texture Tiles 1 and then I added some wordfetti and washi to complete the page.